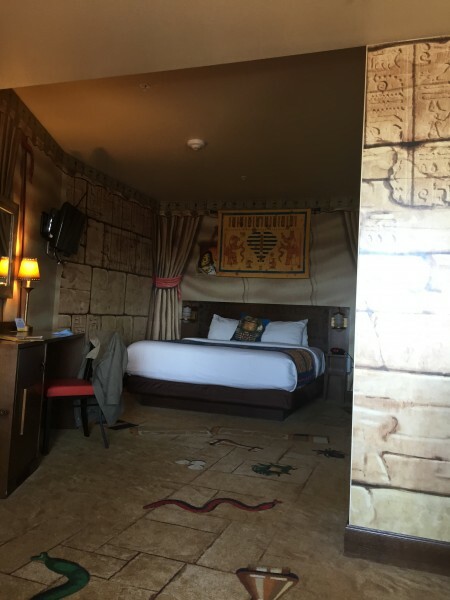 Fred Armisen made a dramatic entrance in his room at the LEGOLand Hotel. He came out from behind the corner of his adventure themed room, but then rethought it. ““Should I act more LEGOy?” Armisen asked, moving his arms more stiffly like LEGO mini-figures. Armisen is a voice in The LEGO Ninjago Movie, the latest animated LEGO adventure for the whole family. The six ninjas go on an adventure with Master Wu (Jackie Chan) and the evil Garmadon (Justin Theroux) to find a way to defeat Meowthra. The LEGO Ninjago Movie opens Friday, September 22. NR: Have you ever been to LEGOland before? NR: Mine too and I am blown away by these rooms. Fred Armisen: They’re really kid friendly. It’s like a dumb thing for me to say but if I designed this hotel, I would’ve forgotten about that. I would’ve been like, “I don’t know. It’s a hotel. Make sure there’s towels.” I took a picture of this room. Look at this. This carpet has tarantulas in it. NR: I’m going to take a picture of that bed. Fred Armisen: Look at that. There’s hieroglyphics about it. NR: I got a pirate room. Fred Armisen: Oh, they’re all different themes? This is too cool. NR: Disneyland doesn’t do this. Fred Armisen: No, that’s what I mean. Every corner of it, there’s hieroglyphics up there. NR: Did you get to do any music for Ninjago, like the flute? Fred Armisen: I wish. I wish. I do have an ambition to be in something that I can also make the music for but someday . NR: Is Hollywood using your music more now that you’ve become known for it on Late Night? Fred Armisen: A little bit, yeah. There’ve been a couple movies where I got to really play the drums. NR: I saw Band Aid at Sundance and I knew you were already a musician. Fred Armisen: Yeah, I love the drums. Any chance I get to play them, I’ll play. NR: Did you get to do your own fight noises? Fred Armisen: Yeah, recording fight noises is a very strange experience because they [say], “We need you to act like you fell.” How does that sound? Ugh. “Now you’re pushing someone.” Ugh. There’s no science to it. You’re just in front of this microphone and you feel like someone is watching you. You’re like someone is watching someone make a movie about fighting, so it’s pretty funny. NR: Did you record the voice of your mech like Dave did? Fred Armisen: No. Zach [Woods] did his robot robot. The way they did mine is I’m just in my robot and I’m controlling it. I sound like myself. NR: They always film you and try to incorporate your gestures and expressions. Is it harder to see yourself in a LEGO mini-figure? Fred Armisen: No, it’s actually nice because I wish that we all moved like that. Kind of robotic, little small movements. It’s so pleasant. I’m jealous of it. NR: Do you get to play with LEGOs while you make a LEGO movie? Fred Armisen: Only on the last day did they present me with a little LEGO figure of Cole. And I did today. We took a picture in front of the ride, then they took them back. Why did they take them back? What are they going to do with them? I want it. NR: When you play a cartoon teenager like Cole, do you do anything to adjust your voice? NR: Do you like when being yourself works, having played so many characters that are not you? Fred Armisen: Oh yeah. It’s easy. Then I just walk into work, sound like myself, a little exaggerated but it’s great. NR: How many of your roles have been closer to the real you? Fred Armisen: A real me doesn’t exist. There’s no such thing. I am an empty shell. I have no emotion, no personality. Even the music I like I copied from someone else. I know very little of the English language. No. I think half and half maybe. I think most of Portlandia, even though I put on a bunch of different wigs, I still sound like myself.